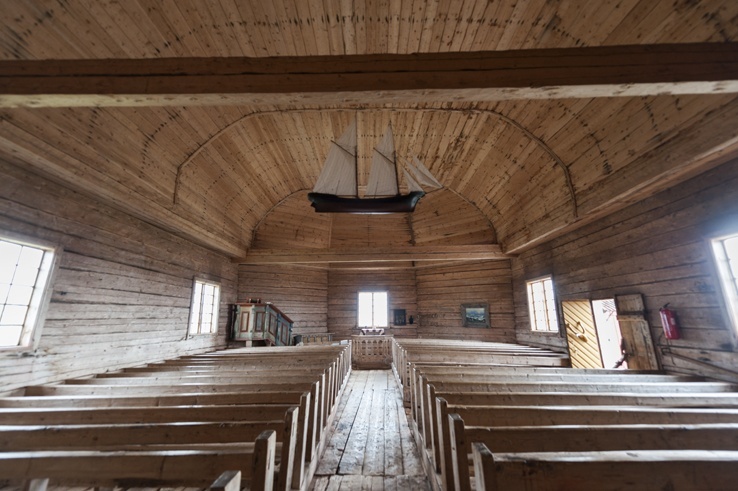 A day visiting the quiet haven of Maakalla Island, a tiny, remote island off the coast of Kalajoki in Western Finland, home to a community of fishermen and a beautiful wooden church. There’s something about islands. Somehow, when thinking of peace and quietude, the image of an island comes to mind. Usually, the island in question is some sort of tropical paradise, a white sandy beach fringed by palm trees and a turquoise sea. The islands of Western Finland are something else. Some of them are a little more than rocky islets, a few hundred meters across. It takes only a few minutes to cross them from one side to the other; there are no buildings other than a few wooden cabins. Maakalla is one of such islands. 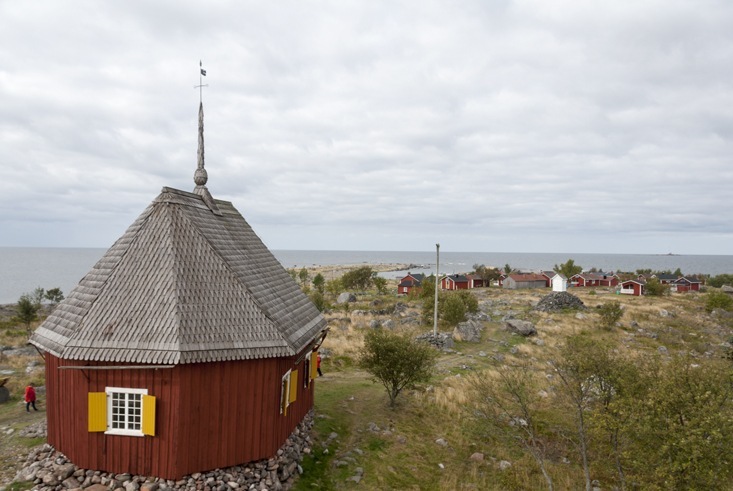 Located a few miles off the sandy dunes of Kalajoki, the island can be reached with a choppy hour-long speedboat ride. We visited on a grey day in late August, and the island suddenly appeared to us from the horizon. First it was a tiny dot, then a faint shadow, and then Maakalla was there, surrounded by the waves and the clouds. We stepped out of the boat and reached the island via a half-submerged slipway. Time seemed to stand still on Maakalla. No one seemed to be around. 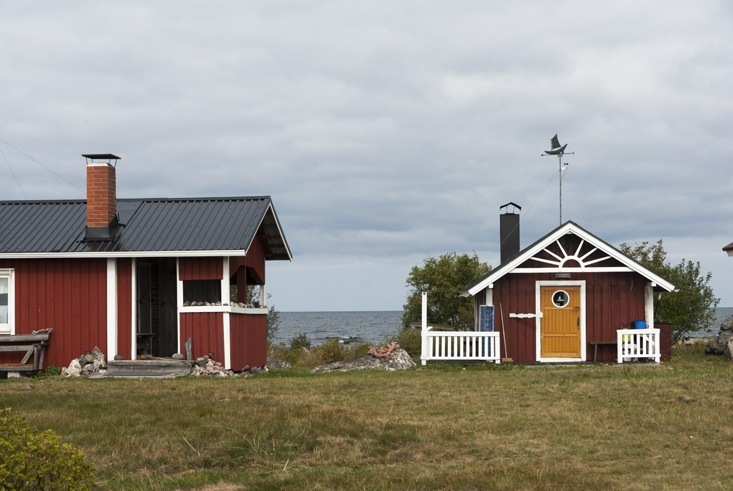 Only a few Finnish flags fluttered in the wind, outside the cabins. It was silent. Still and silent. Our guide Kaisa-Leena told us the story of Maakalla’s unique fishermen community. The island is recent in geological terms; it rose from the sea sometime 600 years ago, as a result of land uplift. 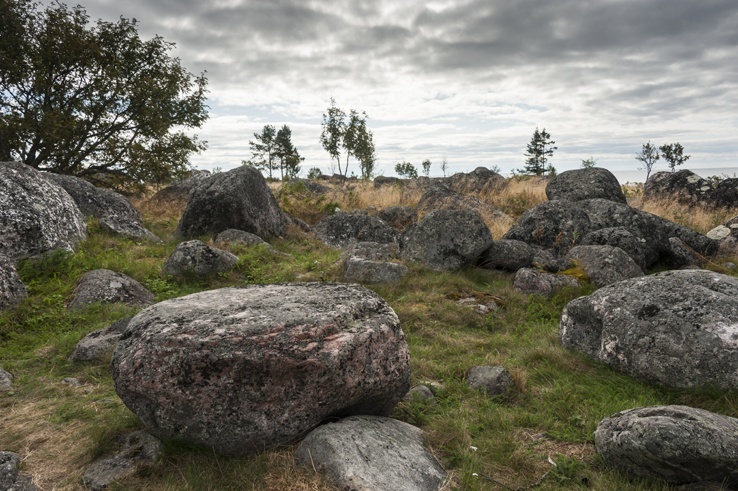 For this reason, Maakalla and its sister island Ulkokalla are known as kari, meaning rocks in Finnish, instead of saari, Finnish for island. 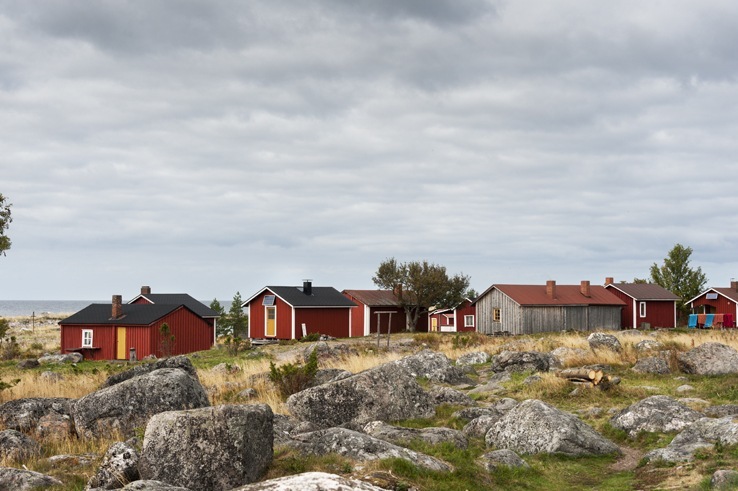 Maakalla was settled shortly afterwards by a community of fishermen who lived there in the summer, fishing for Baltic herring and hunting seals. 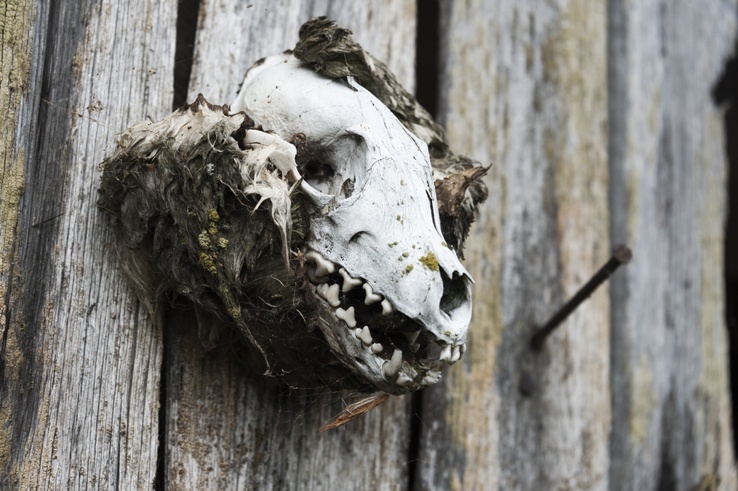 Seal fins and skulls nowadays decorate the front of one of the red-painted cabins, giving me the eerie feeling of being observed. Due to its isolated location, Maakalla was given a special status of self-governance in 1771 by the Swedish king Adolf Fredrik, as Finland was under Swedish rule at the time. Fishermen were given the power to make all decisions regarding the island. Nowadays, the old system still subsists. Kaisa-Leena showed us a big, flat rock at the centre of the island, the location where fishermen still gather each summer to discuss Maakalla’s state of affairs. I can imagine a bunch of rugged fishermen sitting on the moss-covered rocks. However, Kaisa-Leena explained that only one full-time fisherman is left on Maakalla now. Everyone else fishes for fun, but they still retain the power of making decisions. “Most of the times, the fishermen’s council decided whether or not new huts can be built”, our guide said. Not surprisingly, the answer is usually no. The largest building on the island is a wooden church, painted red. Walking into the church felt like walking into the hull of a boat. The inside was bright, allowing us to see dates and signatures engraved on wooden walls and pews. A model ship hung from the window, in the spot where a cross would normally be. I tried to sit on one of the pews, but they were too uncomfortable and narrow, so I retreated outside and decided to climb the island’s viewing tower. From there, the whole of Maakalla was before me. The 44 fishermen’s huts, the church, and the tiny lighthouse, looking like a phone box over a pile of rocks. Later, we discovered that traditionally, visitors to Maakalla were asked to pick up a rock from the beach and add it to the pile, gradually raising the lighthouse in the process. 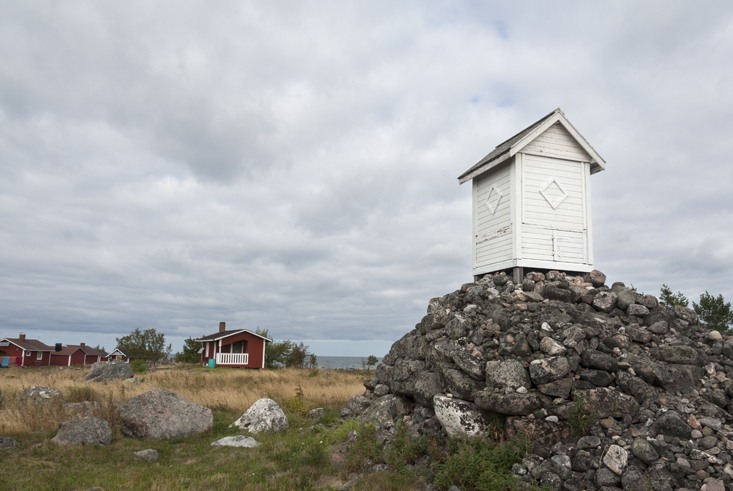 Nowadays, the lighthouse sits over a pile of rocks one and a half meter high. Fishermen living on Maakalla ate nothing but fish throughout the summer months. So, it was fitting that we also enjoyed a fish lunch. 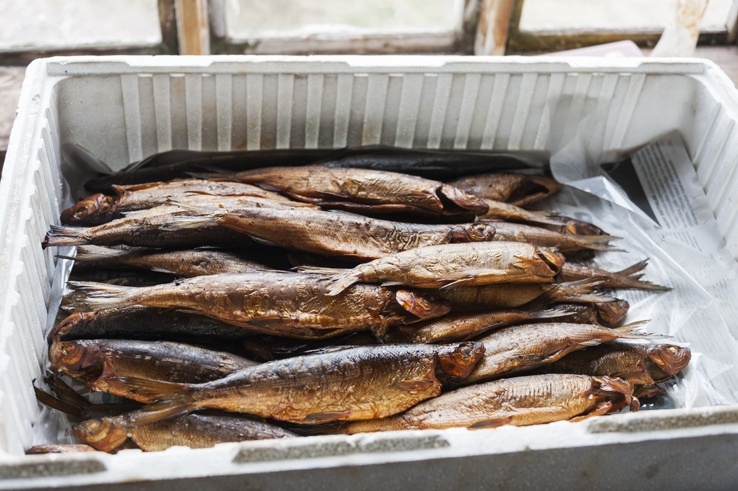 Kaisa-Leena had brought a box full of golden, glistening fish. I held one. They were still warm, fresh from the smoke house. “They were caught last night”, Kaisa-Leena explained. “And smoked this morning”. I piled chunks of white flesh on buttered dark bread, and ate two whole fish on the church steps. After lunch, we walked around the island for a while, enjoying its quietude and stillness. We discovered we weren’t alone, after all. 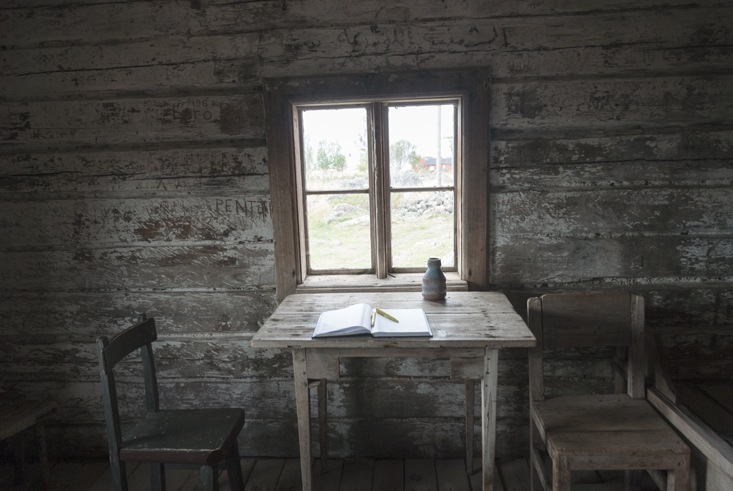 There were people in the cabins behind the hazy windows and wooden shutters. 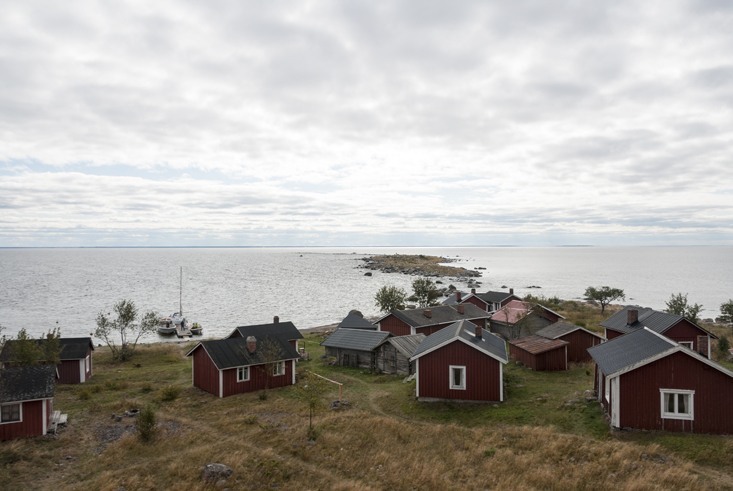 People seemed to whisper, not to disturb the deep silence of Finland’s isles. 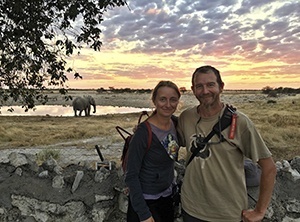 If you wish to visit Maakalla island, contact Kaisa-Leena through her website. 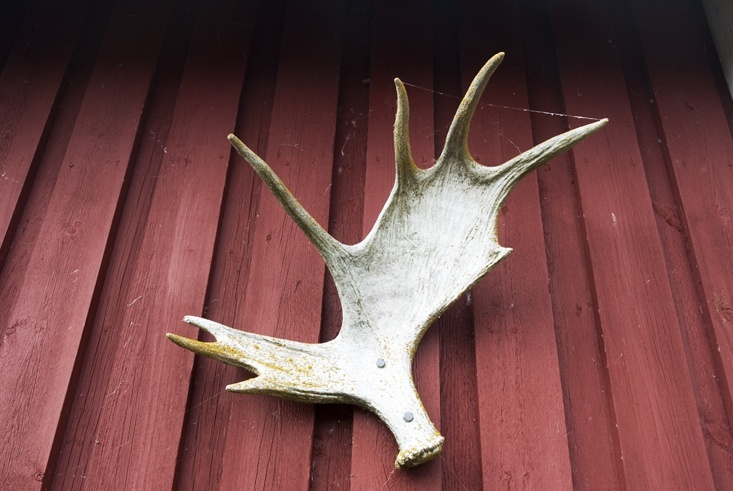 We were guests of Visit Finland as part of the #OutdoorsFinland blog trip. All opinions are our own. Wow spectacular photos – had never heard of Maakalla Island but it reminds me a little of the Faroe Islands. I love finding stuff like those old fishing sheds! Thanks for sharing! Looks so quaint. Love it! Wow, what an interesting story about the island and its most famous profession! It looks like a lovely place to visit. Do you know the current population of the island? Thanks for sharing this special little pile of rocks. 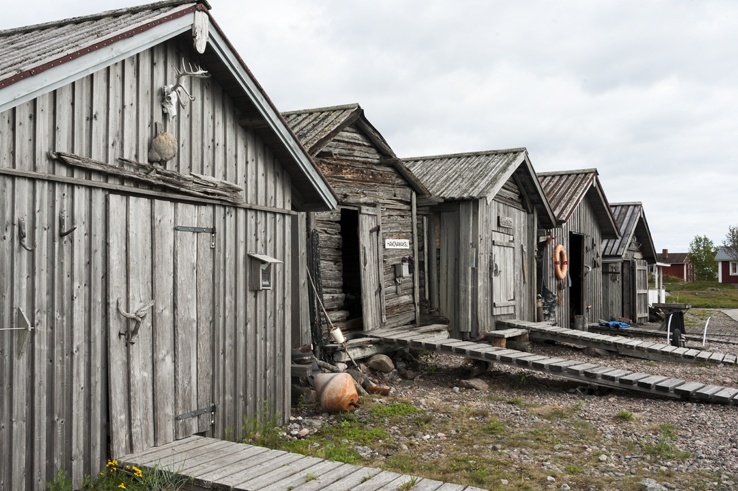 Maakalla Island seems like a perfect time capsule of Finland’s Fishing Community. Great post! Between the smoked fish and the sunset, Maakalla Island is like a little slice of heaven in Finland. Awesome! What a joy it was to meet you in a remote part of the world! This is on my husband’s bucket list! I have enjoyed reading your blog posts. I should say this is great story I have read. Thanks for sharing. 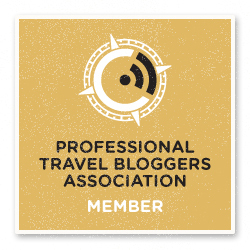 Reading your blog is really enjoyable. Great place to land for fish hunter. The pictures look wonderful. Hope that you will keep updating new trip for us. Thanks for sharing! Thanks! 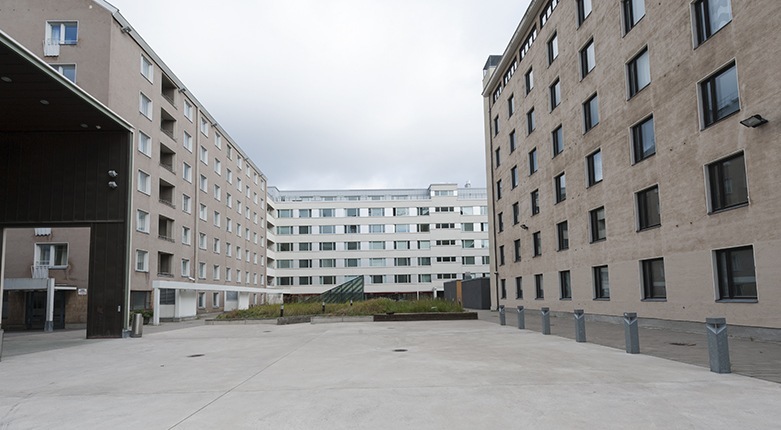 Have a look, we have lots of new content about Finland! Thank you! I hope you do get to visit!